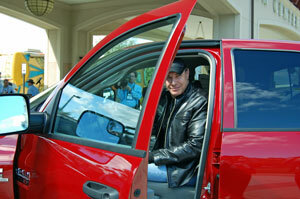 Country music star Michael Peterson was one of the featured speakers at this morning’s “Ride-and-drive” event at the 2008 National Biodiesel Conference and Expo in Orlando, Florida. 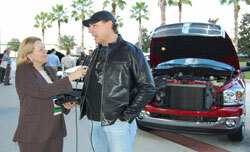 Cindy grabbed Michael for a quick interview right after he returned from a test drive of a 2008 Dodge Ram 3500 diesel pick up truck running on B20. As he stepped out of the vehicle, he joked how he was just sure the organizers meant for him to take the truck home (sorry, Michael!). But, seriously, he really loved the way the vehicle drove and its acceleration. During his interview, Michael said he’s been traveling the country, spreading the good news of biodiesel: what it means for our economy, ecology, and the education of our youth. “There are so many possibilities inherent in this product and the development of it,” Michael told Cindy.